Below is the show packet from our facilities coordinator at Idaho Tents and Event. This should answer questions about shipping and setup time. One 8 foot table and linen drape for each 10’x10′ booth space for Gold and Silver Sponsorships. Wireless internet will be provided. You will receive a special SSID and password during registration. Starting January 7, 2019 IETA will begin allowing vendors that have chosen a level that allows booth selection to begin selecting booth space. If you register for a booth after that date IETA will do the best it can to accommodate your selection for your vendor level. Vendors coming in at a lower level may have already selected their booth space if you register after this date. To make sure you get the full benefit of your sponsorship level please register prior to January 7, 2019. Do not directly ship materials to or from the conference center. Contact Idaho Tents and Events to coordinate all shipping and pickup. Idaho Tents and Events is the provider of the pipe and drape as well as the tables and linens for the booths. Additional furnishings may also be available (tables, cocktail tables, bar stools, etc.). If you require additional exhibit materials, furnishings or services, IETA recommends contacting Idaho Tents and Events. The IETA is not responsible for any arrangements made directly between the exhibitor and any other organization including those listed above. Sponsor registration is not complete until payment is received and the sponsor contract is completed and returned. Sponsors received their contract via email after registration. To request another copy of your contract, please contact OETC. IETA has worked with the hotels listed below to provide special rates for vendors and attendees. 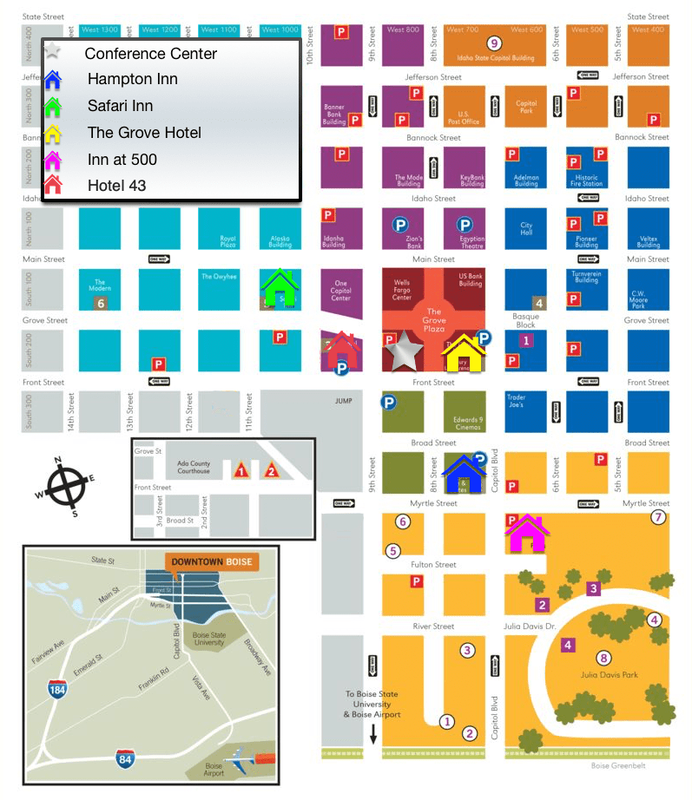 Whether you select one of the hotels below or another hotel of your own choosing, we request that you fill out a hotel information card at the IETA registration desk. Filling out this card helps us offset the cost of the conference; the number of hotel rooms utilized in the area for the conference affects the price IETA pays for the conference facilities. Your help with this is appreciated. Reservation Link Reserve your room here. Hotel Details Learn more about the Hampton Inn. Hotel Details Learn more about the Inn at 500 Capitol. Phone Number (208) 344-6556 or (800) 541-6556. Please mention IETA 2019 for the discounted rate. 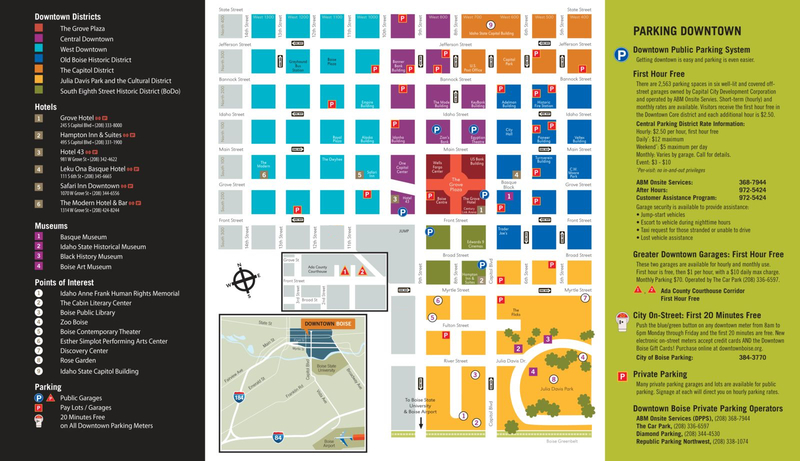 The nearest parking garages to the conference are shown on this map. Booth set up may begin between 12:00 p.m. and 5:00 p.m. on Monday. You may also move in Tuesday from 6:30 a.m. until 8:30 a.m. The exhibit hall will open at 9:00 a.m. on Tuesday, so you will need to be fully set up by then. The last exhibit break ends at 3:30 p.m. on Wednesday, so you can begin to break down at that time. Vendor levels include two lunches per booth space for Tuesday and Wednesday. Tuesday lunch will be a box lunch not seats at the formal lunch except if the vendor purchases the Tuesday conference lunch speaking engagement or sponsors at Gold or higher.